It seems that the only thing faster than a game of Sevens is the sport's development off the field. It's just under 12 months since the Rugby Football Union (RFU) broke new ground by offering central contracts to 10 Sevens prospects, paving the way for Ben Ryan to lead them to within touching distance of a maiden IRB Sevens World Series title. This weekend's London Sevens at Twickenham is a must-win for Ryan's side, who trail Series leaders New Zealand by 13 points in the standings. They will be bolstered by former England flanker Steffon Armitage, drafted in at short-notice following an injury to Greg Barden. "It's not the beginning of the season where in interviews you're being asked what your chances are," Ryan said. "There isn't a long way to go and this is a very important shot for us, in golfing terms. We've got to nail this and we haven't got much leeway. It's harder than any tournament we've had this year, as far as the external pressure to perform, but hopefully we've got a group of players that will rise to the occasion." One of Ryan's aims for his contracted group is to ensure consistency in terms of selection and the former Newbury boss also believes that senior figures at the RFU are warming to the idea of investing in Sevens. While the central contracts are not lucrative, in some cases they offer second chances for players that have slipped under the radar for various reasons - broadening the country's player base and in some cases reminding clubs of what they are missing out in. "Irrespective of what happens in the next two tournaments, one of our goals is to cap the least amount of players," Ryan said. "We currently have 15 capped over the series, which is a record. Even if we add another three or four it will still be a record. Consistency is such a key element in performing well in the series and that's something we've managed to achieve through the central contracts. "Twelve months ago I was pretty much banned from saying 'central contracts' but now everyone seems happy to do it and are more comfortable with where we are and why we have to do it. It's made a really big difference. Now what we've got to is, it's that first step that has given us a big advantage, we've got to utilise it, keep moving forward and make sure our programme does not stop there. It should only be the beginning." At last year's Commonwealth Games, where England finished a disappointing fourth, it was noticeable that their commitment to their Sevens squad remained intact. The winners, New Zealand, and beaten finalists, Australia, employed All Blacks and Wallabies to boost their claims and while Ryan was not offered access to England players, he feels an element of loyalty to his core players - some of whom are now set to move on to big things in the 15-a-side game. "If I had the opportunity, if Johnno said, 'here's half a dozen England players' that might be slightly different," he said. "New Zealand, with World Cups and Commonwealths, have that chance. The dilemma isn't one that I've had to face recently because the options aren't there, there isn't an opportunity to use our EPS players. "There are players that I feel loyal to, I feel loyal to all of them, but we've got players in our system that could quite easily play at Premiership level. Through a combination of bad luck, lack of opportunities, perhaps an injury at the wrong time, they're not there, they're with us. "Not wanting to show too much propaganda for the system, there are players this year that have been offered, and will take up, professional contracts at clubs that will be considered to be the top ones in Europe." 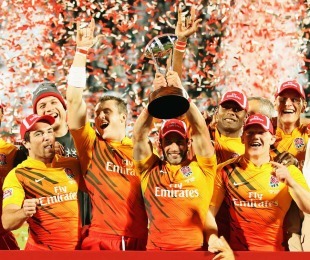 You can watch the England Sevens team in action and join the beach party on May 21 and 22 at Twickenham Stadium in the Emirates Airline London Sevens, the penultimate leg of the HSBC Sevens World Series. Tickets are available from £15 for adults and £5 for juniors by clicking here.